This amoena of subtle, delicate tones has something unusual and attractive. 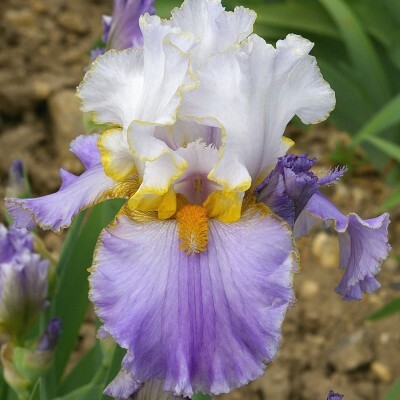 White, slightly bluish petals and lilac-white falls turning to lilac toward the edges. The tangerine beards are continued by a dark lilac stripe. 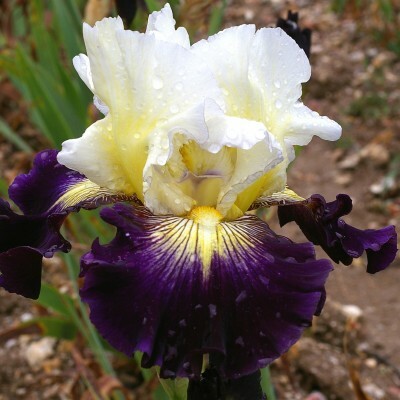 Good shape, generous flowering and good branching. 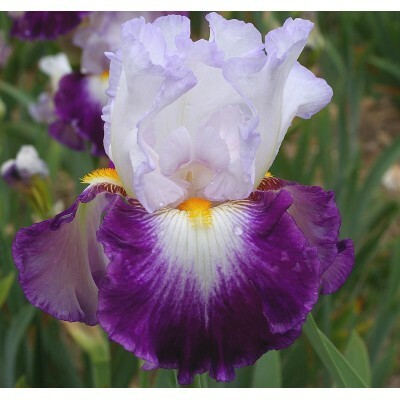 Magnificent contrast between the immaculate white standards and purpled magenta falls. Clear yellow beards prolonged by a white medial stripe. It has the vigour of its parent "Jazzed Up" and flowers generously because of its profusion of buds: 11 to 14 on each stem! 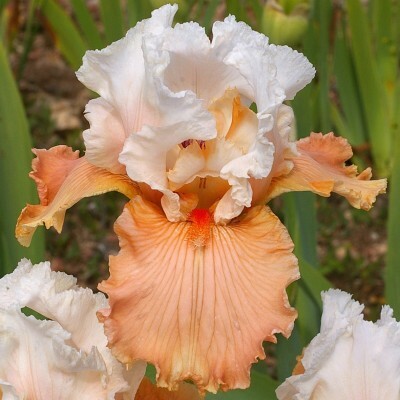 Nice amoena of pastel tones: creamy white standards and soft buff-apricot falls. 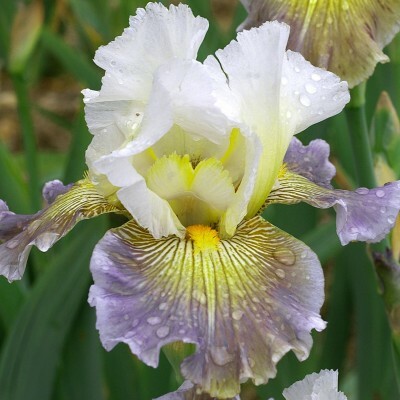 Rich flowering (7/8 buds per stem) reblooming often in July or August. Very large, original amoena with pure white standards and copper beige falls finely edged with cream. Pale yellow beards and styles. Very wide flowers (11.5cm x 16.5cm) remain in proportion to the foliage. Excellent! Magnificent offspring of our champion "Ravissant". 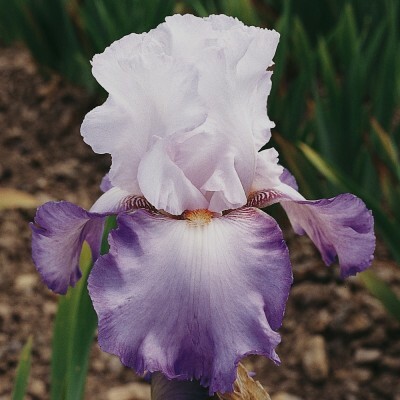 Totally pure white standards and large pinkish purple falls with a large white heart, contrasting against the orange-yellow beards. Moderate ruffles, excellent branching. Pure, crisp colours. A very decorative flower. 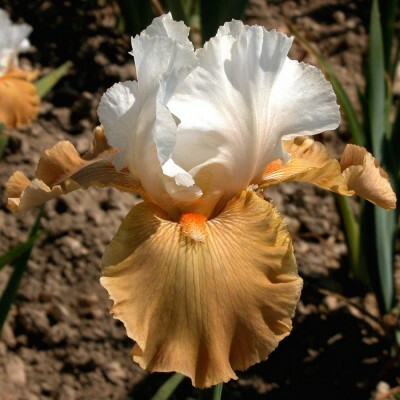 A very appealing Amoena with pure white standards infused with pale apricot as the buds open, and copper-apricot falls. Bright tangerine beards. The falls are vigorous, nearly horizontal and closely ruffled at the edges. Well-balanced strong stems. Robust descendant of "Futuriste" and "World Premier". 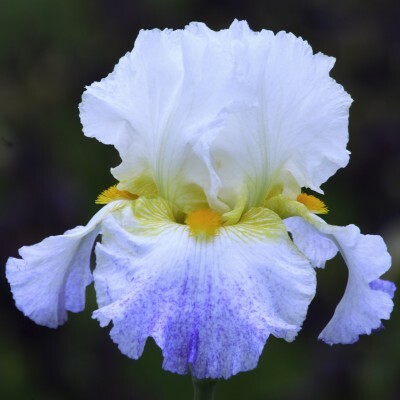 Very pale blue standards and strong indigo-blue falls, fairly discreet yellow beards. 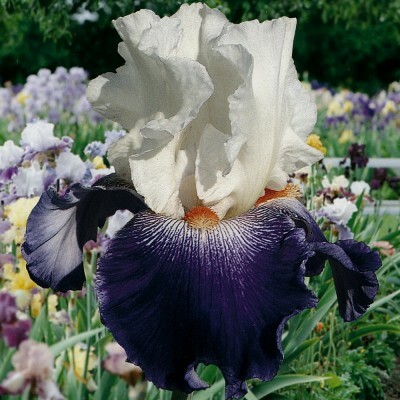 Enormous flowers enlivened by strong, ample ruffles. 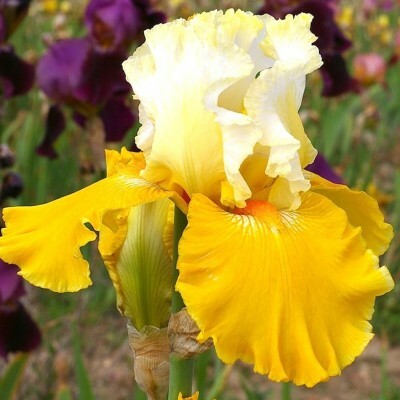 Flowers quite close to the main stem, a characteristic inherited from its parent, "World Premier". 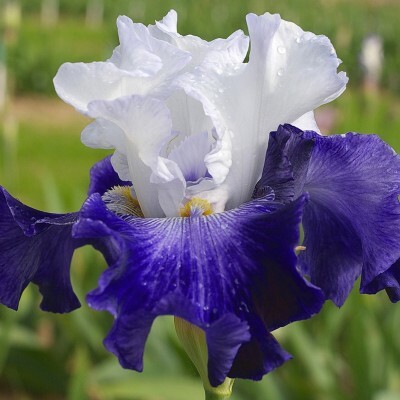 We hesitated for a long time whether to introduce this iris, but lots of iris lovers urged us that we should... So here is an amoena with mid-grey rather than white standards. The golden yellow beards light up the grey of the nearly horizontal falls. 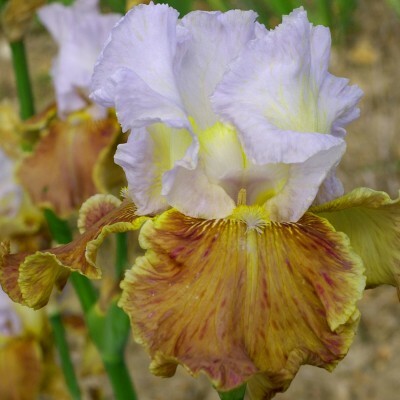 Certainly an unusual colour, but original, and would have its place in many a garden. 5 to 6 buds. 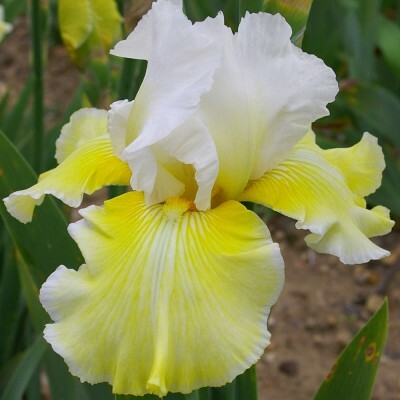 A fresh and agreeable ensemble: pure white standards and light lemon yellow falls, darkening around the golden yellow beards. Moderately ruffled flowers with almost horizontal falls. 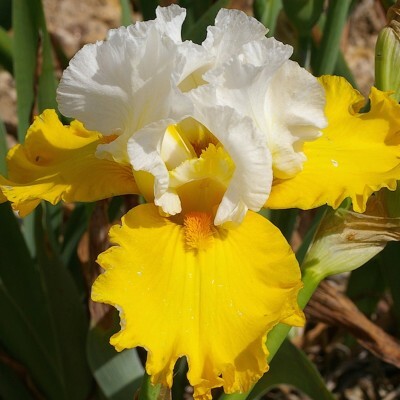 White standards infused with golden yellow at the base, lemon yellow falls with a white area below the bright lemon yellow beard. Superb stems with 3 "branches" carrying 11 to 13 buds on average. Healthy foliage and very prolific. Ideal plant for the garden, lovely soft colour. 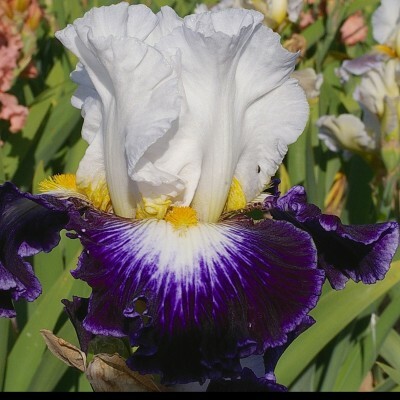 Huge flowers with white standards tinted with lavender and soft lavender falls with lavender beards. Thick stems with perfect branching. The delicate tones of Cumulus give a great feeling of freshness. 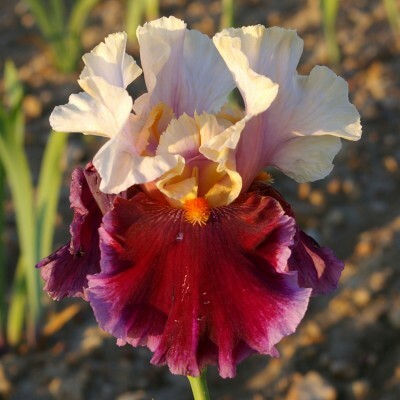 New and seducing amoena: white standards flushed light pink at their base and with a hint of cream at tip; red maroon falls with a large (1 cm) near pink border. Tangerine beards lightening this uncommon combination of colours. Yes, "Fabuleux" is fabulous. 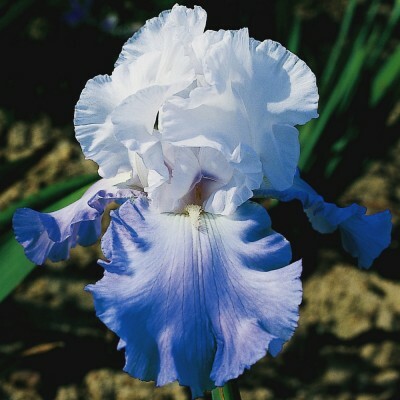 It has ruffled pure white standards and white falls with a pure, bright blue border (2 cm wide), slightly darker on edges. 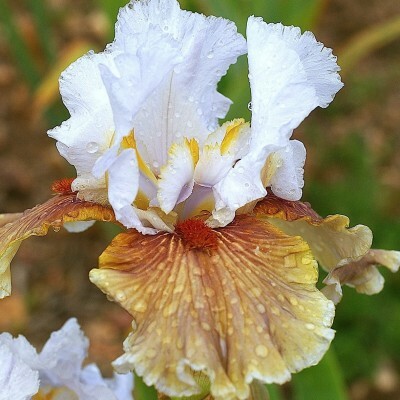 It has a wonderful shape with wide strongly ruffled falls, yellow beards and strong stems. In fact, a taller and darker "Alizés". 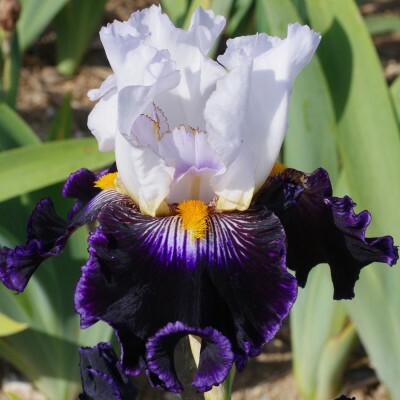 Wonderful contrast between the pure white standards and the velvety, very dark violet falls, nearly black when the flower first opens. Deep egg yolk yellow beards light up the whole. 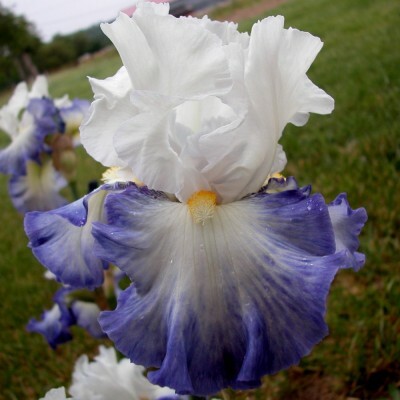 Moderately sized flowers with ruffled edges, a well-proportioned plant. 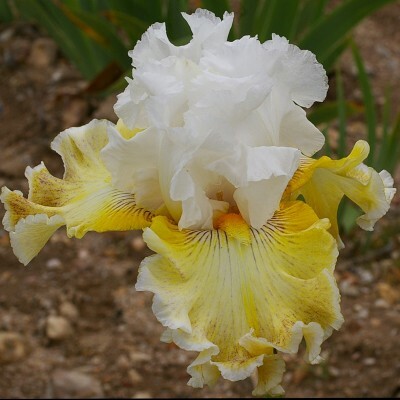 We are very happy to call this iris after the famous Gien pottery in our neighbouring town. Belongs to the category of "miniature tall beardeds", a sort of bonsai but quite beautiful. 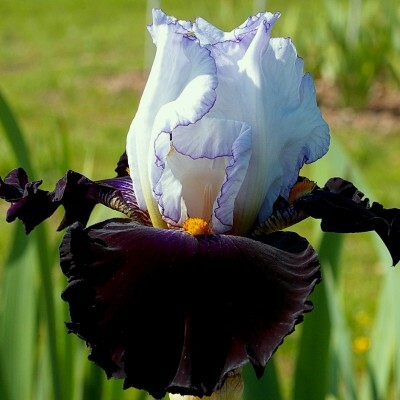 Pure white standards and purple to black falls with a fine white border. 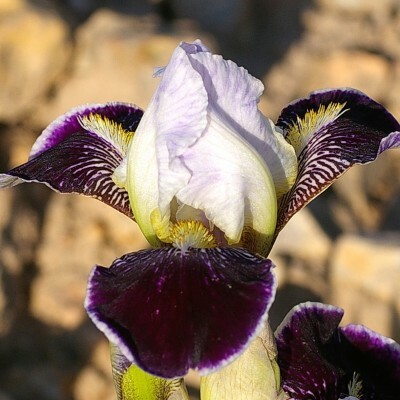 The yellow beards are surround by purplish black striations. Most interesting! 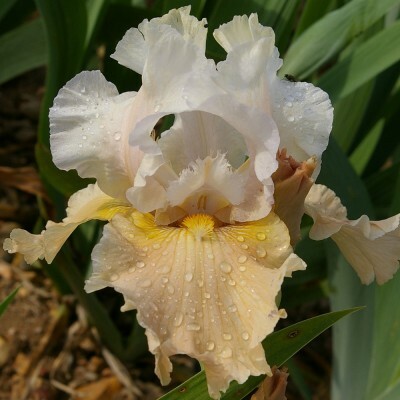 An excentric son of "Romantic Evening" with white standards and falls between off white, brown and light copper. Bright rust-red beards add character to this amoena. Styles are white tipped with copper brown. Shafts with 2 to 3 branches, each carrying 8 to 12 buds. 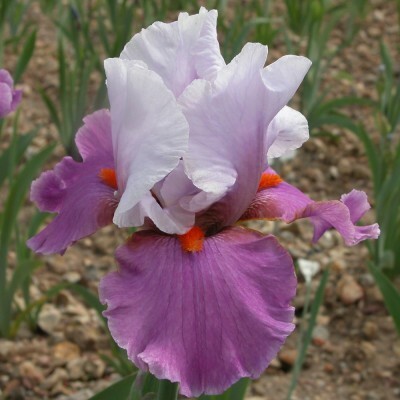 Standards between pale mauve and light purple. Wide falls in pearl-white, turning slightly pink. Coral tipped, white beards. Excellent branching with an average of 9-10 buds per stalk and often 3 flowers blooming at the same time. Not far from an excellent orange amoena. 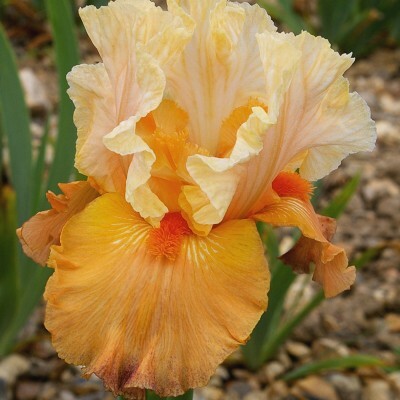 White standards infused deep orange at their base, burnt orange falls with deeper orange texture veining. Wide beards deep orange. Firm flowers of good size. 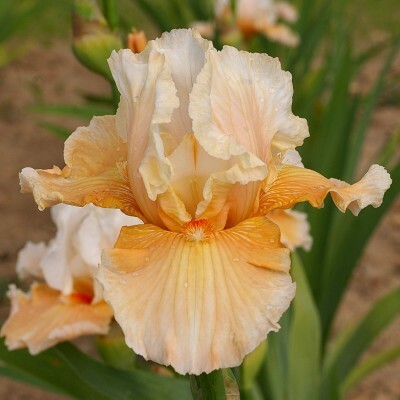 Pretty amoena with rosy white standards (especially towards the centre) and peach pink falls. Tangerine beards edged with bright yellow. An average of 7 to 9 buds, spread over three stems. Edges are slightly crimped edges. 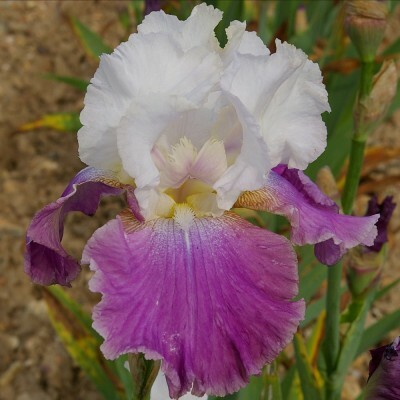 Gracefully arched white standards pleasantly complement the wide rosy-lavender falls carrying white beards. 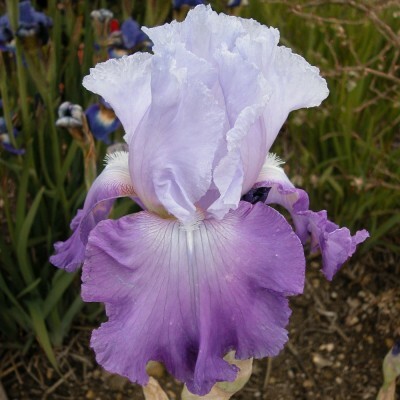 These huge flowers (12 cm x 16 cm) are well-bodied and have a gently ruffled shape. 8 to 9 buds per stem. 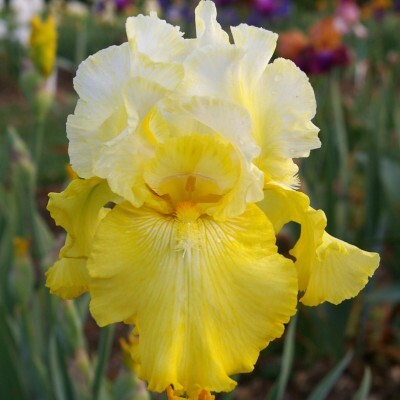 We think this is the best yellow amoena in existence, due to its dazzling and unequalled contrast. Standards of pure white and semi-horizontal undulated falls of ultra-vivid and consistent golden yellow edged with tiny ripples. Pale orange beards. Excellent and well branched stems. Long flowering. 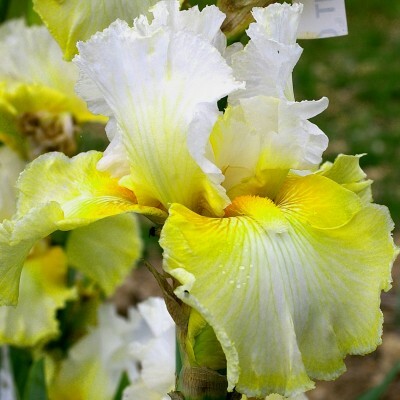 White standards veined with a soft lemon yellow. 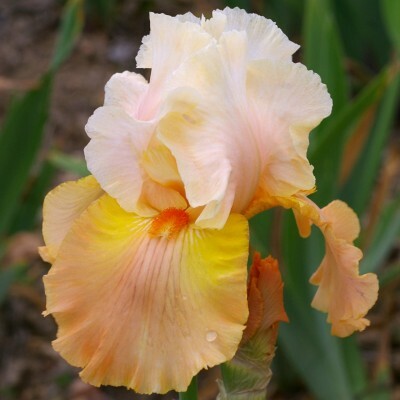 Very bright gold yellow falls, yellowish orange beards with fine brown stripes. Lightly waved, medium sized flowers. 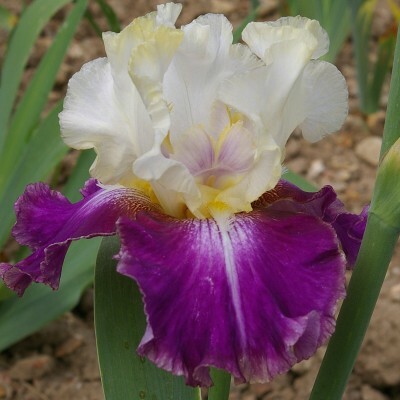 An excellent colour for this son of "Ring around Rosie" and "Impulsive". 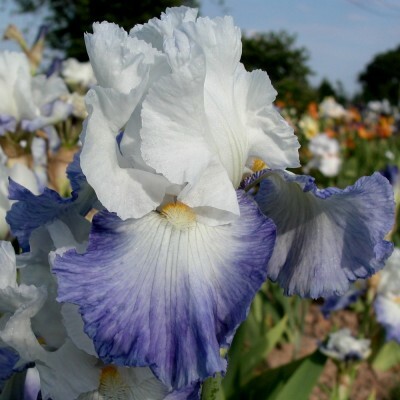 Wide and ruffled bright mid-blue falls with a white centre streaked with the same blue. Tangerine beards and vivid white standards. Sturdy stems and vigorous vegetation. First prize at the competition of Orleans in 1997. White standards infused with soft yellow at their base. White falls overlaid at the top with a soft butter yellow pattern. Orange yellow beards. 6 to 8 broad ruffled flowers on well-branched stalks. 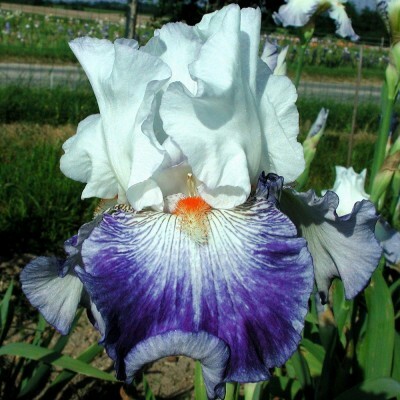 Very vigorous, forming quickly large and decorative clumps. Like a cloud in a clear blue sky. White standards and light blue falls with discreet white beards. 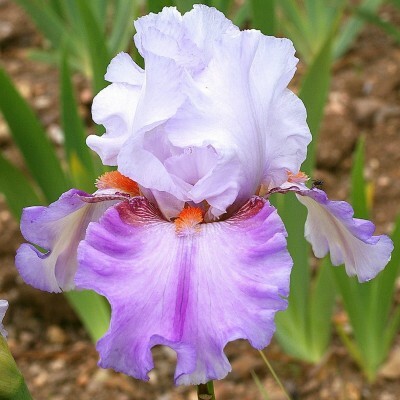 Imposing flowers (12 cm x 18 cm) well-proportioned to the strong foliage and the sturdy stems. An average of 8 to 9 buds. 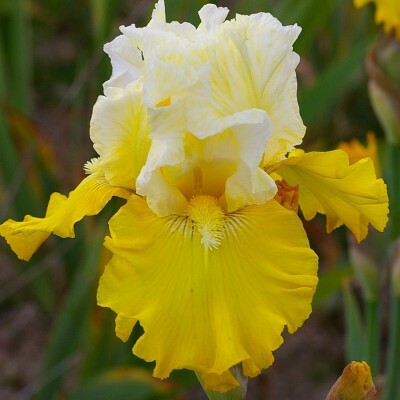 A vigorous and seductive yellow amoena. 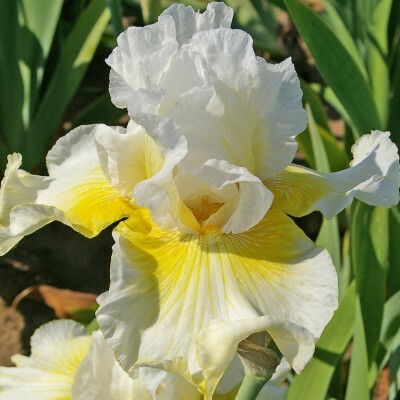 Lightly ruffled white standards and broadly ruffled falls finely shaded with butter yellow. Lemon beard. Strong, well branched with abundant flowering.